Proactive protection: Instantly scans all downloaded applications, files, folders and SD memory cards for trojans, viruses, worms, spyware, adware and other threats with ESET’s proactive heuristics technology. Anti-theft security system: Simple SMS commands that help you remotely locate, lock or wipe your Android device in the event it is stolen or simply misplaced. GSM users can prevent unauthorized use of their mobile devices by registering trusted SIM cards. A SMS alert is sent to your alternate phone silently when any other SIM card is inserted into your GSM Android mobile device. Security audit with built-in task manager: Monitor all vital phone functions including battery life, free disk space, running processes, Bluetooth and device visibility. And then take action on the spot to terminate any processes and remedy settings that raise your risk profile. Password Protection: Secure your device with one user-defined master password. All module settings as well as un-installation (Android 2.2 or 2.3) can also be protected by the same password. SMS/MMS/Voice antispam: Define trustworthy contacts with customizable black/white lists or simply block messages and phone calls from unknown numbers. 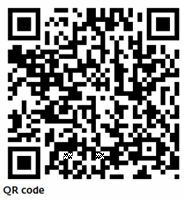 Download the ems_beta.apk file by scanning the QR code below using your mobile device with QR Droid or Barcode Scanner. Download EMS_Beta.apk and transfer to your smartphone or tablet via USB. 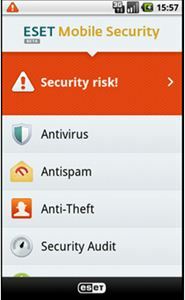 The ESET Mobile Security for Android works well in Android 2.0 or later. However, you also can download the user guide for more details of ESET mobile security for Android.